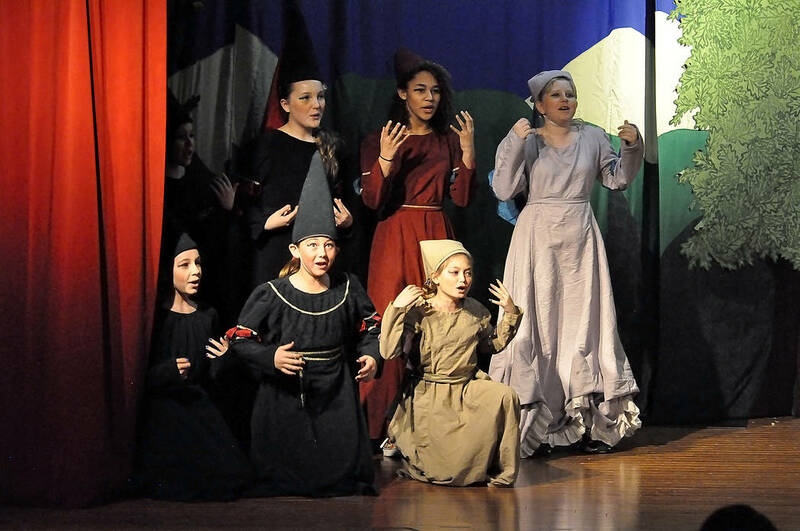 Horace Langford Jr./Pahrump Valley Times A group of school-aged girls played the damsels in distress in a performance of "King Arthur's Quest" on Jan. 20, 2018. The venue, produced by the Missoula Children's Theatre, was held at the Pahrump Valley High School and was sponsored by the Pahrump Arts Council. Auditions for the Missoula Children’s Theater’s “Snow White and the Seven Dwarfs” will be at 1 p.m., Jan. 21 at the PVHS auditorium. Students K-12 are invited to try out. Rehearsals will be Tuesday-Friday from 3:30 p.m. to early evening. Assistant directors will be chosen to help with the production. Two performances will be held: at 2 p.m. and 5 p.m. on Saturday, Jan. 26 in the high school. Tickets will be sold at the door, $3 per student, $5 for adults, and $20 per family. For more information, call the Pahrump Arts Council office, 775-505-1362.